cDepartment of Neurosurgery (D.H.), University of Iowa, Iowa City, Iowa. BACKGROUND AND PURPOSE: The use of the Pipeline Embolization Device in the management of recurrent previously stented cerebral aneurysms is controversial. The aim of this study was to evaluate the efficacy and safety of the Pipeline Embolization Device in the treatment of recurrent, previously stented aneurysms. MATERIALS AND METHODS: Twenty-one patients with previously stented recurrent aneurysms who later underwent Pipeline Embolization Device placement (group 1) were retrospectively identified and compared with 63 patients who had treatment with the Pipeline Embolization Device with no prior stent placement (group 2). 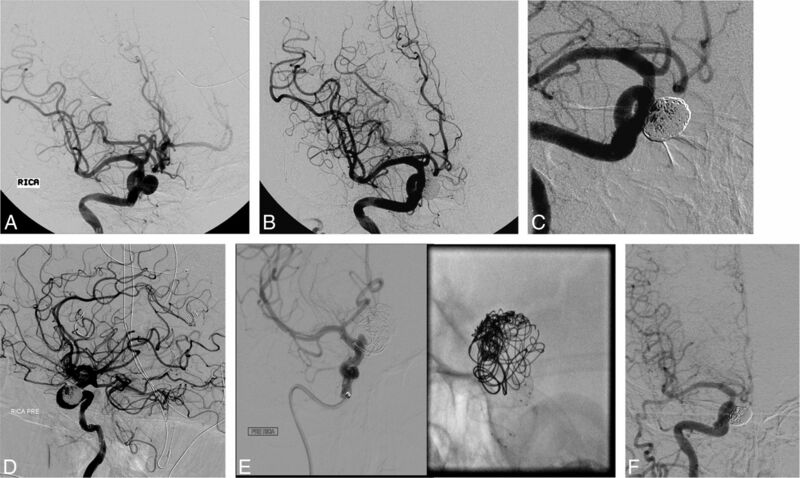 Occlusion at the latest follow-up angiogram, recurrence and retreatment rates, clinical outcome, complications, and morbidity and mortality observed after treatment with the Pipeline Embolization Device were analyzed. RESULTS: Patient characteristics were similar between the 2 groups. The mean time from stent placement to recurrence was 25 months. 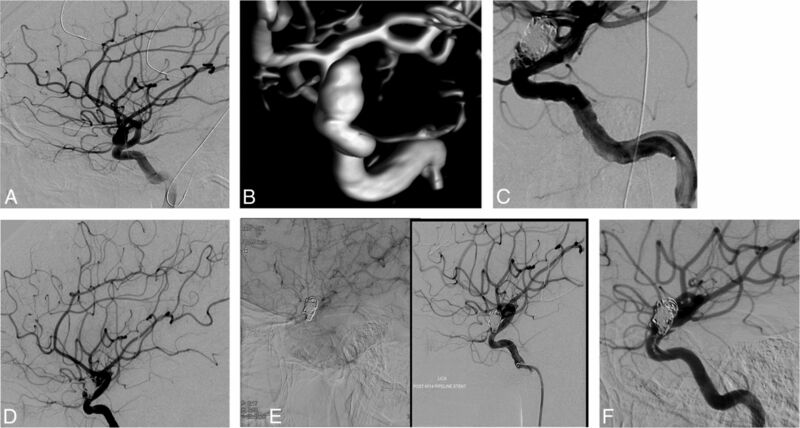 Pipeline Embolization Device treatment resulted in complete aneurysm occlusion in 55.6% of patients in group 1 versus 80.4% of patients in group 2 (P = .036). The retreatment rate in group 1 was 11.1% versus 7.1% in group 2 (P = .62). The rate of good clinical outcome at the latest follow-up in group 1 was 81% versus 93.2% in group 2 (P = .1). Complications were observed in 14.3% of patients in group 1 and 9.5% of patients in group 2 (P = .684). CONCLUSIONS: The use of the Pipeline Embolization Device in the management of previously stented aneurysms is less effective than the use of this device in nonstented aneurysms. Prior stent placement can worsen the safety and efficacy profile of this device. The management of recurrent previously stented aneurysms remains controversial. There are no recommendations to indicate the most appropriate management strategy, to our knowledge. In 2011, the Pipeline Embolization Device (PED; Covidien, Irvine, California) was FDA-approved for the treatment of large and giant wide-neck aneurysms in the internal carotid artery, from the petrous to the superior hypophyseal segments.9 The PED belongs to a family of devices known as flow diverters, which work by acting as a scaffold for endothelial overgrowth of the aneurysm neck.10 The main structural differences from previous stents are the higher metal surface area coverage compared with previous stents and the low porosity, which allows more flow reduction into the aneurysm neck.11,12 The overall use of the PED has gained popularity mainly because of its high success rate in achieving aneurysm occlusion and low aneurysm recurrence and retreatment rates, especially compared with other endovascular interventions.13,14 Early reports have questioned the efficacy and safety of the PED in treating previously stented aneurysms.15⇓–17 The aim of this study was to evaluate the role of the PED, both its efficacy and safety, in the treatment of recurrent, previously stented cerebral aneurysms. Patients with cerebral aneurysms treated with the PED between May 2011 and January 2015 at a single institution were reviewed. Twenty-one patients with previously stented aneurysms who later underwent PED placement for aneurysm recurrence were retrospectively identified (group 1). Blinded to outcome, we matched them with 63 patients who underwent treatment by using the PED without prior stent placement in a 3-to-1 ratio, on the basis of patient age and aneurysm size (group 2). PED treatment was offered for recurrent complex, wide-neck aneurysms, partially thrombosed aneurysms, and aneurysms with multiple recurrences treated unsuccessfully by other means. Baseline patient characteristics, aneurysm characteristics, and procedure characteristics were recorded. The study protocol was approved by the Thomas Jefferson University institutional review board. Patients were started on clopidogrel and aspirin for at least 10 days before the intervention. An angiographic evaluation was performed to assess aneurysm dimensions. Treatment with the PED was performed with the patient under general anesthesia and neurophysiologic monitoring. After embolization, another angiogram was obtained. Patients were evaluated in the hospital for any complications. After discharge, patients were scheduled for clinical and angiographic follow-up.18 Patients continued taking both aspirin and clopidogrel for 6 months after the procedure, at which time clopidogrel was to be discontinued. The outcomes of interest in this study were the following: 1) the efficacy of the PED in the management of previously stented cerebral aneurysms evaluated for angiographic occlusion at the latest follow-up angiogram, recurrence and retreatment rates after PED placement, and clinical outcome as measured by the modified Rankin Scale at the latest available follow-up; and 2) the safety of the PED in the treatment of recurrent cerebral aneurysms with a stent in situ assessed by complications, morbidity, and mortality observed after treatment. Modified Rankin Scale scores of 0–2 were considered favorable outcomes, and mRS scores of 3–6 were considered poor outcomes. Modified Rankin Scale scores were assessed by the treating neurosurgeon on the basis of the last follow-up visit. Angiographic evaluations were obtained to monitor any recanalization or residual filling after PED treatment. Aneurysm occlusion at follow-up was evaluated by the treating neurosurgeon and was categorized as complete or incomplete. Data are presented as mean and range for continuous variables and as frequency for categoric variables. Analysis was performed by using the Wilcoxon matched signed rank test and the McNemar test as appropriate. P values ≤ .05 were considered statistically significant. Statistical analysis was performed with STATA 10.0 (StataCorp, College Station, Texas). In the 21 cases, the mean patient age was 51 years. Seven patients presented initially (before the first endovascular intervention) with a subarachnoid hemorrhage (33.3%) (Table 1). Aneurysm locations are detailed in Table 2. Fifteen aneurysms were saccular (71.4%); 4, fusiform (19%); and 2, pseudoaneurysms (9.5%). The average initial aneurysm size before any attempted treatment was 12.5 mm. Before PED treatment, 12 patients had a recurrence on follow-up angiography, whereas 9 patients had aneurysm remnants that eventually grew. Although patients with no stents were matched on the basis of age and aneurysm size, there was no statistical difference in other baseline characteristics between the 2 groups except for a higher percentage of patients who presented initially with SAH in group 1 (P = .004) (Table 3). In patients who had prior stent placement, the mean number of interventions before PED placement was 2.3, ranging from 1 prior intervention to 4 previous attempts (Table 4). Previous stent interventions included stent-assisted coiling in 57.1% and stent placement alone in 42.9% of patients. Sixteen aneurysms were initially coiled before stents were deployed (76%). Stents that were initially used included the Enterprise stent in 52% of patients and the Neuroform stent in 48% of patients. The mean time from stent placement to recurrence was 23 months. The mean time from the initial treatment to PED placement was 40.4 months. The mean number of PEDs placed was 1.3, ranging from 1 to 4. The average procedure length for PED treatment of previously stented aneurysms was 66 minutes versus 58 minutes for nonstented aneurysms (P = .6). Technical difficulties were observed in 5 patients with prior stent placement (23.8%). Technical difficulties were reported by the treating neurosurgeon and identified by reviewing the operative reports. In 1 patient, because of the prior stent placement, several catheter advancements and several readjustments of the microcatheter and wire were required to achieve a good position for PED deployment. In another patient, the distal two-thirds of the PED was deployed with good wall apposition; however, because of prior stent placement, the proximal third did not open and good wall apposition was not achieved. In 2 patients, there were difficulties in placing the PED across the neck of the aneurysm and achieving appropriate overlap with the previous stent and covering the proximal tines of the stent. In another patient, 4 PEDs were required to span the proximal portion of the aneurysm and extend proximally to the pre-existing stent. On the other hand, technical difficulties were encountered in 3 patients with no prior stent placement (4.8%). There were difficulties in opening the proximal part of the PED during deployment in 2 patients who had a severe tortuosity of the inflow of the aneurysm, and a balloon was used to expand the device. Preoperative P2Y12 reaction unit values were available in 19 patients in group 1 (mean, 128.1) and 51 patients in group 2 (mean, 127.6) (P = .98). In-stent stenosis was observed in 2 of the 21 patients with previous stent placement (9.5%), one patient with 50% stenosis and the other with <50% stenosis. In group 1, 3 patients did not have a follow-up angiographic evaluation because of loss to follow-up. Of the 18 patients who had follow-up angiograms, PED treatment resulted in complete aneurysm occlusion in 10 patients (55.6%) (Fig 1). In group 2, 7 patients did not have available angiograms, 3 patients because of death following the procedure and 4 patients who were lost to follow-up. Of the 56 patients with follow-up angiograms, 45 patients had complete aneurysm occlusion (80.4%). In group 1, 8 aneurysms (44.4%) were found to have incomplete occlusion with residual filling or recurrence after PED placement (Figs 2 and 3), whereas in group 2, 11 aneurysms were found to have incomplete occlusion (19.6%). This difference of 24.8% was statistically significant (P = .036). The mean angiographic follow-up time from PED placement to the last angiogram was 10.4 months in group 1 and 10.6 months in group 2 (P = .816). A, A 53-year-old woman who presented with headache and was found to have a 10-mm right superior hypophyseal artery aneurysm. B, Stent-assisted coiling was performed, and the control angiogram shows complete occlusion. C, A follow-up angiogram at 6 months shows complete occlusion of the aneurysm dome and minimal filling of the interstices. D, A follow-up angiogram after 2 years shows recurrence of the aneurysm. E, At that point, embolization by using the PED was performed. F, A 6-month follow-up angiogram shows complete occlusion of the aneurysm. 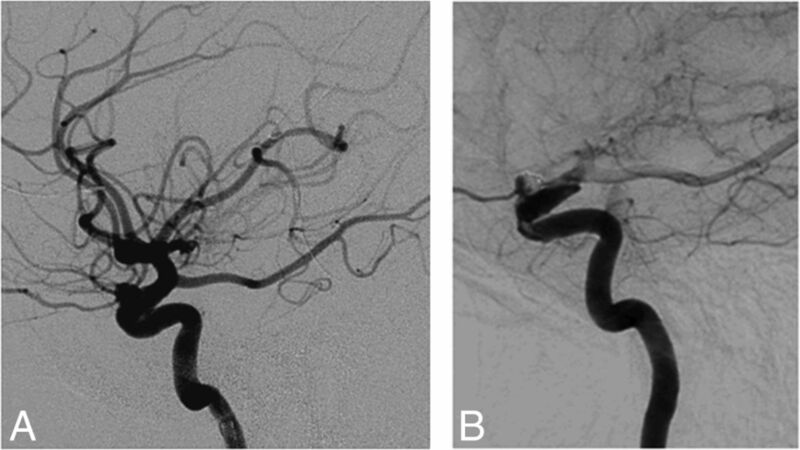 A and B, A 28-year-old woman who presented with subarachnoid hemorrhage resulting from a ruptured 11-mm left carotid ophthalmic artery aneurysm. C, Stent-assisted coiling was performed. This resulted in incomplete occlusion of the aneurysm. D, Three-year follow-up angiogram shows growth of the residual. E, Treatment with the PED was performed, with incomplete wall apposition. F, Six-month follow-up angiogram shows incomplete occlusion. A, A 54-year-old woman with a 6-mm left carotid ophthalmic artery aneurysm, which was initially treated with stent-assisted coiling but recurred. B, Treatment with the PED was performed. A 12-month follow-up angiogram shows incomplete occlusion. The 8 aneurysms with incomplete occlusion in patients with prior stent placement had different characteristics. In general, 3 aneurysms were larger than the average size (12.5 mm) and 5 aneurysms were smaller. More specifically, incompletely occluded aneurysms included 3 vertebrobasilar aneurysms of >15 mm, 2 carotid ophthalmic aneurysms (6 and 9 mm), 2 aneurysms in the cavernous internal carotid artery (5 and 7 mm), and a 9-mm superior cerebellar artery aneurysm. Five aneurysms were previously coiled, and 3 were not. The 11 incompletely occluded aneurysms in patients without prior stent placement included 3 cavernous ICA aneurysms (10, 20, and 21 mm), 2 paraclinoid ICA aneurysms (9 and 16 mm), 3 carotid ophthalmic aneurysms (5, 10, and 13 mm), one 12-mm middle cerebral artery aneurysm, one 6-mm superior hypophyseal aneurysm, and one 7-mm posterior carotid wall aneurysm. Two previously stented aneurysms managed with the PED required another retreatment, with placement of another PED (11.1%). No aneurysms required additional coiling or clipping. In patients with no prior stents, 4 patients required retreatment post-PED placement (7.1%). The rate of retreatment was nonsignificantly higher in patients with a prior stent (P = .62). Mean follow-up was 15.7 months in group 1 and 18.7 months in group 2 (P = .278). In patients with previous stent treatment, 17 patients had a good clinical outcome (mRS 0–2) at the latest follow-up (81%), with 14 patients having an mRS score of zero (66.7%) and 3 patients having an mRS score of 1 (14.3%). Four patients had an unfavorable outcome (19%), with 1 patient having an mRS score of 3, 1 patient with an mRS score of 4, 1 patient with an mRS of 5, and 1 patient with an mRS of 6. In patients with no prior stent placement, 93.2% had a good clinical outcome versus 6.8% with a poor clinical outcome. There was a trend toward worse clinical outcome in patients with prior stent placement (19%) as opposed to patients without prior stent treatment (6.8%) (P = .1). Complications within 30 days after treatment were observed in 3 patients (14.3%) in group 1 and 6 patients in group 2 (9.5%) (P = .684). In group 1, 1 patient with a giant vertebrobasilar artery aneurysm had a posterior cerebral artery territory infarct and later developed hydrocephalus requiring ventriculoperitoneal shunting and then developed multiple shunt infections (mRS = 5). Another patient had retinal emboli causing visual changes (mRS = 1) after PED treatment of a carotid ophthalmic aneurysm, and another patient had a right intracerebral hemorrhage after PED treatment of a right ICA aneurysm and died (mRS = 6). Mortality was similar in both groups (4.76%). In group 2, 5/6 patients with complications had giant aneurysms. Complications in this group included 2 intracerebral hemorrhages, 3 MCA infarcts, and 1 basal ganglia stroke. There were no statistically significant differences in the rate of complete occlusion (62% versus 50%, P = .7), complications (10% versus 18%, P = .9), or good clinical outcome (82% versus 80%, P = 1) among patients who had prior Neuroform or Enterprise stent placement, respectively, though patients with prior Neuroform stents had better overall outcomes after PED deployment. Our results show that stent placement negatively affects the efficacy of the PED in the management of recurrent aneurysms. The rate of complete aneurysm occlusion was significantly low (55.6%), especially compared with the high success rate of PED treatment reported in this study for subjects without prior stent placement (80.4%) and in other studies, with most reporting a high occlusion rate of >80%.12⇓–14,19 In addition, the rate of retreatment (11.1%) was considerably higher than that reported with PED treatment of nonstented aneurysms. Zanaty et al13 reported a 5% rate of retreatment after PED placement. The complication rate seen with PED treatment of recurrent previously stented aneurysms (14.3%) falls within the higher spectrum reported in the literature (0%–12%). Kallmes et al20 reported a morbidity and mortality rate of 8.4% with PED treatment. Brinjikji et al19 reported a procedure-related morbidity rate of 5%. In patients with prior stent treatment, 1 patient had a posterior cerebral artery infarct after PED treatment and then developed hydrocephalus requiring ventriculoperitoneal shunt placement and another patient developed emboli to the ophthalmic artery causing visual disturbances. Thromboembolic events are well-known complications of PED treatment.12,19,20 Because this device consists of a bare metal stent that aids in neointimal tissue formation, it can lead to platelet activation causing local thrombosis and cerebral infarction or distal embolization. The large metal surface area coverage of the Pipeline Embolization Device and frequent use of multiple devices also contribute to the occurrence of thromboembolic events. Treatment with the PED poses a risk for hemorrhagic complications as well. This was observed in 1 patient who had an intracerebral hemorrhage and died. The occurrence of intracerebral hemorrhage in patients treated with the PED can be due to multiple factors, including the dual-antiplatelet therapy that patients receive, hemorrhagic transformation of ischemic stroke, and hemodynamic changes related to placement of the PED. Furthermore, the presence of a prior Neuroform or Enterprise stent may increase the risk of both thromboembolic and hemorrhagic complications associated with PED placement because these stents act as foci of thrombus formation and patients are started on aspirin and clopidogrel (Plavix) before stent placement. Hemorrhagic and thromboembolic complications occurred at a nonsignificantly higher rate in previously stented aneurysms. Since the initial reports about treatment with the PED, the use of this device has been controversial in the management of recurrent previously stented aneurysms. Fischer et al15 criticized both the safety and efficacy of the PED in the treatment of aneurysms with prior stent placement in a series that included 30 lesions treated previously with conventional stents. They reported that adverse events occurred in only 1 of 54 patients (2%) without a previous stent placement after PED treatment and in 4 of 30 patients (13%) in whom a stent was previously placed before PED treatment. They added that the observed successful occlusion rate was lower for aneurysms with a previous stent placement (65%). The complication rate of 13% and the occlusion rate of 65% reported in their study are very much comparable with the rates obtained in our study (14.3% and 66.7%, respectively). They concluded that the presence of a previous stent may reduce the hemodynamic effect of the PED. This negative interaction was attributed to a disruption of the process of wall apposition of the PED to the parent vessel, preventing the process of appropriate device endothelialization. Nelson et al17 reported that 1 of 2 aneurysms (n = 31) not initially occluded with the PED was previously treated with another stent. They concluded as well that prior stent placement impairs effective apposition of the PED to the parent artery, thus slowing or preventing the neointimal formation and endothelialization processes and potentially inhibiting complete aneurysm occlusion. This outcome was indeed observed in our series in several patients with prior stent placement, in whom appropriate wall apposition was impeded by the previously placed stent. Similarly, Lylyk et al16 observed that of 63 aneurysms treated with the PED, the only aneurysm that remained patent at 12-month follow-up had been treated previously with stent-assisted coiling. They deduced that the presence of a pre-existing stent may have limited the efficacy of the PED by impairing the apposition of the PED to the wall of the parent artery, which led to endoleaks that maintained patency of the aneurysm and disrupted the endothelialization process over the surface of the PED. In addition, the presence of these devices can complicate the navigation of the delivery catheter into position and the actual deployment of the PED, increasing the technical difficulty of the procedure. Technical difficulties involving catheter advancements were encountered in our study as well. These increased the complexity of the procedure and the ability to properly deploy the PED. Chalouhi et al21 highlighted the technical difficulties observed with PED placement in aneurysms with a previous stent in situ. Because the PED should be deployed distal to the stent, the distal end of the PED may “catch” on the previously placed stent, which may cause anchoring and stretching of the device, leading to less effective results. They suggested that performing simultaneous balloon angioplasty may be useful in optimizing PED apposition to the vessel wall. Given the negative association between stent placement and later PED treatment, physicians should be careful when selecting the primary intervention to treat large complex wide-neck cerebral aneurysms that are amenable to PED treatment and less likely to be cured with conventional endovascular procedures. If a stent was placed initially, recurrence would be less eligible for PED treatment and might require surgical clipping to achieve aneurysm occlusion. The main limitations of this study include the single-center experience with a small number of aneurysms. Another important limitation is the retrospective nature of this study. Furthermore, the mean time of angiographic follow-up was limited (10 months). The use of the PED in the management of previously stented cerebral aneurysms is less effective than the use of this device in nonstented aneurysms. Prior stent placement may decrease the rate of aneurysm occlusion following treatment with the PED, may increase the rate of complications associated with the procedure, and may increase the chances of encountering technical difficulties during PED deployment. Initial management of large wide-neck complex cerebral aneurysms amenable to PED treatment with conventional stents should be carefully planned because recurrence of stented aneurysms is less likely to respond to PED placement. More studies are required to determine the best treatment for recurrent previously stented aneurysms. Disclosures: Stravropoula Tjoumakaris—UNRELATED: Consulting Fee or Honorarium: Covidien. Pascal Jabbour—UNRELATED: Consultancy: Covidien. Accepted after revision September 16, 2015.